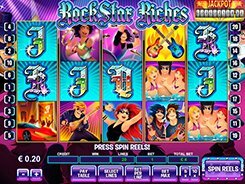 Rockstar Riches is another high-limit video slot by NYX developed specifically for high rollers. Themed around rock music, the slot includes a pack of theme-related symbols such as a rock drummer, bass guitar players, a posh Ferrari near a concert hall, etc. As most of the other slots produced by NYX, this particular game has an immense betting range that starts at $0.1 and reaches a stunning $1000 per spin. The best paying combination that consists of five scatter symbols will lead to a payout of $50,000. Besides, the slot features a locally accumulated jackpot that is awarded for hitting either five red-haired lead singers or five wild symbols on an active payline. This local progressive jackpot is accumulated and grows within a specific casino every time players make a real money bet on Rockstar Riches. To make the gameplay even more entertaining and rewarding, the slot features a free spin round activated by three, four or five scatters occurred anywhere on the screen. You get 5, 10 or 15 retriggerable free spins depending on the number of scatters that started the feature. PLAY FOR REAL MONEY!